Solitaire is a popular card game because, unlike many widely-known card games, it is played with only one person. All a player needs is a single deck of cards. Of course, many people have only played solitaire on their computers and the computer game deals the cards itself and prevents players from making illegal moves. If you have to play with a real deck, you may need to brush up on the rules. Shuffle the deck of playing cards. Place the card from the top of the deck upturned on the left side of the playing surface. Deal six cards to the right of the first upturned card, placing them face-down, so there are seven piles of cards. Place the card from the top of the deck upturned on the card to the right of the first upturned card, then deal a card face-down on top of each of the five cards to its right. Deal cards so the third pile of cards from the left has two face-down cards and one upturned card on top, the fourth pile has three face-down cards and one upturned card, and so on. The seventh pile must have six down-turned cards and one upturned card on top. Place the deck of cards on the upper-left corner of the playing surface, above the first face-up card. Take three cards from the top of the deck and place them in a face-up pile to the right of the deck. Take any aces from the face-up cards on the top of the seven piles or the first card on top of the pile of cards next to the deck and place them in their own piles on the upper-right corner of the placing surface, above the right-most piles of cards. 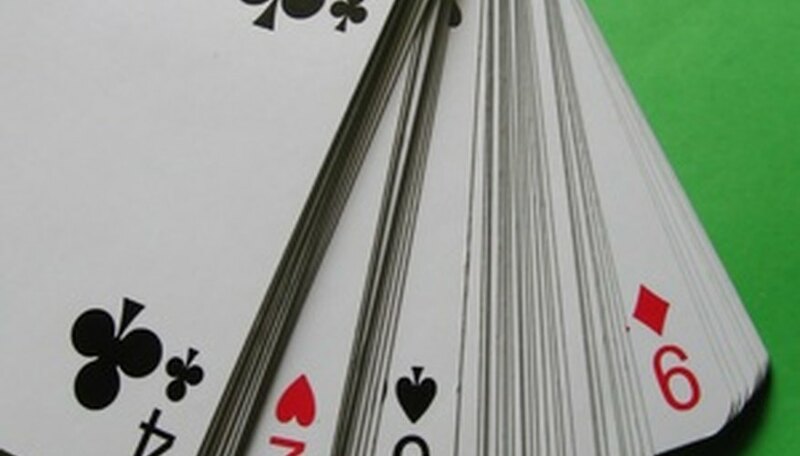 Build up the piles of aces with cards from the same suit. For example, place the two of clubs on top of the ace of clubs, the three of clubs on top of the two of clubs, and so forth. Move cards from the face-up cards on top of the seven piles or the first card on top of the pile of cards next to the deck and place them in descending order on other cards, alternating by color. For example, place the red four of diamonds on top of the black five of clubs. Turn face-down cards face-up when they're on the top of one of the seven piles. Place kings in one of the spots the seven piles occupied when they're empty. Build up the piles with kings in the same way, by placing a red queen on top of a black king, a black jack on top of the black queen, and so on. Deal three more cards on top of the pile next to the deck when you're unable to make any more moves. Keep dealing until you can make a move. Once the deck is empty, turn the pile of face-up cards face-down and deal three cards from its top again. Build up the four piles starting with the aces with one pile for each suit of cards to win the game. The deck and seven original piles of cards are empty at this point. Not every game of Solitaire can be won. Start the game over if you&#039;re stuck.